Jason Rebello and Jean Toussaint were the stars of first night of the new Curated by Empirical series at Kings Place that presents the band’s favourite UK and international artists. The first set of the night was given to this amazing duo which in the second part was joined by Empirical. As a sextet they explored the musical legacy by U.S. composer and pianist Andrew Hill. Four compositions filled the time, which seemed to run by very quickly: Whole in One written written by Rebello, Waltz For Etienne & Ebony and Milena by Toussaint, and finally a sophisticated composition Timelessness by the African composer Bheki Mseleku. Jason Rebello has certainly one of the most beautiful smiles I have ever seen and he translates it into the softness of the piano sound through his hands’ beautiful dialogue with the keys. His sounds are as unexpected and unequivocal as they are picturesque. “I try to use my hands like orchestral instruments and rather than doing one thing I give them different things to do,” he says. Much more music is added by Jean Toussaint's tenor saxophone. He brought the definition of sound you would expect from one of Art Blakey’s hard-bop saxophone players, but at the same time theree was a surprising lightness to his sound that seemed to come from subordination to the spaciousness and sweetness of the compositions. This was especially evident in the Mseleku - a pianist and saxophonist in one person - whose work made these two instruments really talk to each other. 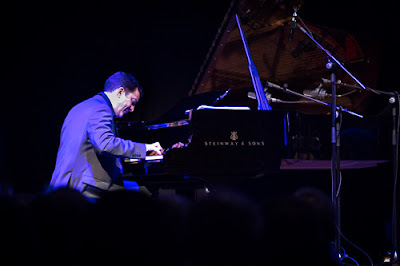 Rebello and Toussaint have known each other for nearly 30 years and I had the impression that they were chatting about things from time and space within their stunning performance. These beautiful tales only could leave you with yearning for more but as the compère of the first set, the charming Shane Forbes, came on stage to announce the interval, I sadly had to acknowledge that that was the end of the first half. With every end there is a new beginning and a fresh excitement. I have always admired Empirical's work discipline, their unity and openness in taking musical risks. I have seen their performances many times and never been disappointed. 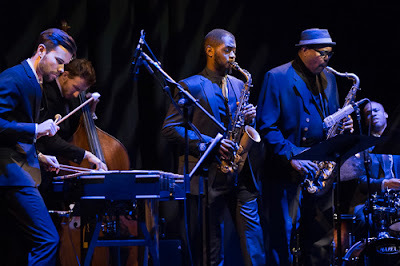 I adore seeing them listening with attention and appreciation to each other, and this gives me, as an audience member, a kind of duty of disciplined listening, reminding me at the same time how demanding improvisation actually is. After around four years of playing exclusively in quartet they have decided to create more space for others and approach the challenge with a bigger line up. The bright spectrum of Andrew Hill's music, from piano solos to orchestral works, gave them the relevant repertoire. 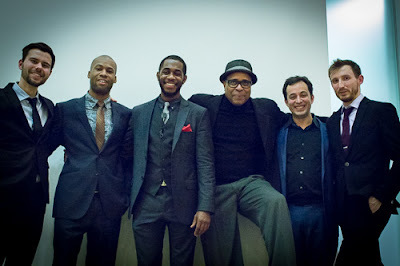 Inspiration for Empirical came from the whole range of Andrew Hill's output, but Empirical chose to focus on the 1960s Blue Note material, with Refuge and Spectrum from Point of Departure (1964), recorded with the incredible Eric Dolphy and Joe Henderson, the title tune from Black Fire (1964), and the incredibly beautiful ballad Erato from Pax (recorded 1965, released1975), among others. None of the band had played Hill’s music prior to this project. Hill's compositions were hard to learn, they revealed, especially as the band didn't have the original scores and had to decipher the mysteries of the compositions by ear, making their own decisions about what the composer might have had in mind. “He was a genius!” says Toussaint. “We had two solid days of rehearsal and even if there is a lot of space for improvisation, you better follow his strong structures. Without knowing them when you get lost, you might get lost forever!” he laughs. They didn't get lost! All of the musicians agreed that Hill's creative output hasn't been explored yet as much as it deserves. This could be the right time for his bold concept of jazz to be reassessed through the musical maturity and visionary courage of Empirical and their masters, Jean Toussaint and Jason Rebello. Undoubtedly it defines a musical bridge between the old and the new. To witness it was inspiring.